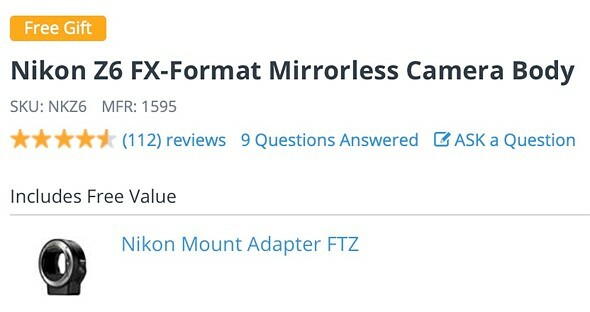 Nikon's FTZ mount adapter usually retails for around $250 on its own and cost just $150 when bundled with the Z6 or Z7 camera, but now it's being offered free of charge at multiple retailers, including Adorama (Z6, Z7), B&H (Z6, Z7) and Amazon (Z6, Z7). 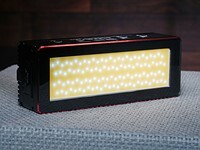 A screenshot of the deal as seen on Adorama. The FTZ could have been included to help sweeten the deal, sure. But I’m surprised nobody is talking about how Nikon was already throwing in the 24-70 f/4 lens with the camera body for 40% off. :-( just like the Z6 film makers kit its sadly NOT available for us in Europe. I saw one of these in the store today on a Z6, and my first thought was: couldn't Nikon have made one that is less bulky? Or couldn't they at least make a second one, that is just circular, and without the tripod mount? Nikon knows no one is going to buy the new lackluster glass while sitting on a car-worth of old FX. I wouldn‘t call the Z mount lenses that have been released „lackluster“ at all. Based on the reviews available, they‘re all very good optically. At the least they're huge, and that completely defeats the point of a mirrorless. I was almost dead-set on Z7, but went the Fuji route because it actually made sense for the purpose. SkvLTD - i thought arguments you raised are by now extinct, but apparently they still live among fuji fans, together with equivalence denial. Why comment about things you have absolutely no clue on? The native Z lenses are of superior quality to previous generation lenses. A camera company giving freebies? Maybe the price war is just heating up or maybe Nikon is having some financial issues. But then again, I did hear this is a temporary promotion. Facts to follow in the next financial report. Ok I had to leave this thread due to the intensity of the comments. Could someone calmly please explain what’s in the bump at the bottom of the adapter. Is it actually an af motor or a tripod mount. Only answer if you are certain. Bonus: you're always ready for a tripod. that cure looks worse than the sickness. You know DPR included the picture of the camera not sitting flat just to make Nikon look bad. You couldn't show a picture that more clearly made this adapter look worse. Will it fall backwards if I mount little lens and a flash with the head pointed straight upwards? It kills me the camera doesn't sit flat. Wasn't there any alternative? Why won't Nikon use the same mount of the existing dSLRs integrate the FTZ to Z & J so million lenses with dizzying alphabets would not require an adapter? Thousands of Nikon ILC owners with millions and millions of lenses wouldn't transition to Mirrorless to leave behind their investments, I wouldn't if I had one. Have they thought about it? This way, they wouldn’t benefit from the advantages of the Z mount compared to the F mount when it comes to designing new lenses though. For wide to normal lenses, there are significant optical considerations when the mount is larger and closer to the sensor. Canon developed and sold an entirely new lens mount (EF-S) for crop cameras. This allowed the lens to project into the body a little farther because a crop camera mirror is a little smaller than a full frame mirror. All that effort just so the lens could get a little closer to the sensor. Must be worth something to move it a lot closer now there is no mirror at all. What is wrong with an adapter for your old lenses? Unless it has some crazy thing protruding from the bottom. "Thousands of Nikon ILC owners with millions and millions of lenses wouldn't transition to Mirrorless to leave behind their investments,"
The whole point of the adapter is that you don't have to "leave behind" your investment in lenses. The adapter allows you to use those older lenses. It's a way to bridge the old with the new. That's better than just sticking with the old, just for the sake of sticking with the old. For example, take a look at Canon. They dumped their entire FD system, with no forward compatibility with the new EF system. Out with the old, in with the new. It was a drastic measure, but it ultimately succeeded for them. But these days, thanks to smart adapters, you don't have to abandon the old. You can adapt the old (lens) to the new (body) using a smart adapter. Including the adapter reduces the price promotion potential or even takes the place of price promotions. This is what Nikon should have done from launch. 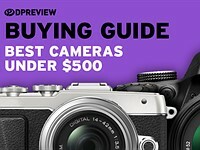 At my local camera retailer all of the big brands are offering big deals on their FF mirrorless cameras. If you look at the camera market as a whole, It's going to be interesting to see whether Nikon Canon Sony and Panasonic can all survive the next 2-3 years. The problem they all have is that the market is shrinking and mass market casual photographers are not immersed enough to know or care whether their new camera has a mirror or not. Personally I don't think the DSLR' s days are as numbered as what you gearheads think. All nikon mirrorless lenses are look so ugly. What the lcd window for? It looks amateur all in one camera. Exact focal length / focus distance / hyperfocal information. Quite useful, if you need that kind of information (and know how to use it). Should have been included in the first place, their adapters have been almost double the price of the Canon's from FT1 to now the FTZ while both theirs and Canon's are equally well made. What Nikon should do is start producing with Z mount some of their legacy lenses (with F mount), to avoid having to use adapters... If Sigma is able to produce lenses with different mounts, why could Nikon not do that? Some lenses can be designed much better with the shorter flange distance of mirrorless cameras, but the design of other lenses may just not be improved... These lenses should be produced immediately with the Z mount. "If Sigma is able to produce lenses with different mounts, why could Nikon not do that?" It all comes down to cost. It's a lot cheaper to make one FTZ adapter than it is to re-release a bunch of former F-mount lenses with an FTZ adapter permanently attached to them. Sigma doesn't have much choice but to offer various mounts. It's just the cost of doing business for them. But Nikon obviously didn't want to incur that cost. It's just too high a cost for Nikon. They obviously would rather invest their resources in making new lenses, rather than taking existing lenses and re-releasing them with a Z mount. Besides, I don't think people are THAT unwilling to use an adapter for existing F-mount lenses. They just weren't willing to pay the money that Nikon was charging for the adapter. Besides, even if Nikon did re-release a bunch of F-mount lenses with a Z mount, they STILL would have to offer the FTZ adapter anyway...for people who want to use their existing F-mount lenses! @T3 - your argumentation is incorrect. It's a lot more profitable to re-release a bunch of former F-mount lenses in Z mount, because then customers would have to buy them again, instead of buying adapter once. However message to market would not be acceptable and would hurt company in medium to long term. The adapter is fine, but only for lenses that you already have... I would myself not buy today any F mount lens (obsolete mount). Nikon should produce a number of legacy lenses directly with Z mount, just a few popular ones that are not on the Z roadmap currently... This would immediately increase the number of Z native lenses available. @arbux - "re-release a bunch of former F-mount lenses in Z mount"
unless a customer never had any F mount less will think of this retrofit lens you've proposed. why buy same lens with a new mount rather than an adapter which works with all existing lens? new Z mount is developed with a wide mouth (more lens diameter), less flange distance to let more light in and adjusted distance to the new sensor without mirror. what's point of fitting F mount less (less diameter glass) with a new mount and add an additional extension tubes to get a sharp image on sensor? mounts are not just caps/threads to screw in to cameras. The price war is heating up. There wouldn't have been a brouhaha over adapter if Nikon had made the adapter part of the camera body. I heard they are thinking about it. There would be total recall and replacement and everybody would be happy !!! It's not an "adapter" if it's part of the body. It just becomes a DSLR with the mirror removed, which doesn't allow them to explore lens designs with shorter flange distances. It also wouldn't allow them to explore lenses with larger throat diameters. They would have to stick with lenses that have a 44mm throat diameter and a 46.5mm flange distance, which is what the Nikon F mount is now. Screw the big lens mount. It will be fun to watch ... the winner is when a camera is bundled with the adapter. It is not price war ... it is war of adapters. I wouldn't buy a Z specially for the lack of native lenses. NO adapters ! You also said that about the Leica Q.. do you even own a camera? How are the F mount lenses obsolete? Did the glass suddenly fog over? Did the apertures seize? Do they now only render every third pixel? The FTZ mount certainly has benefits going forward but there remains many decades of use for all those F mount lenses. The advantage of old Nikon f mount lenses is that they are numerous, high quality and dropping in price on the used market. @tailings... I had the Nikon F mount 50mm f/1.4G... This one is obsolete, the newer designs are immensely better (e.g. Sigma Art, or even better: the new Nikon Z 50mm f/1.8)... Other F mount lenses are still to be considered good, like the 200mm f/2 or the more recent 70-200mm f/2.8.... I wouldn't buy today the 14-24mm f/2.8G, quite obsolete... and I know that the announced Nikon Z 14-24mm will be fantastic. "Better" does not mean everything else is obsolete. Not by a long shot. That 50/1.4 still has value to anyone who owns it, or anyone who wants a 50/1.4 rather than a /1.8, etc. 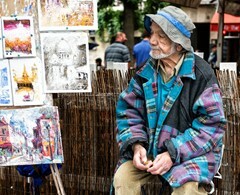 Here, I'll prove your 50/1.4 is not obsolete: Will you give it to me for free? No? Why not? Surely it has no value if it is obsolete. Do you still perceive value in the lens? I thought so. If I'm wrong, rest assured, I'm here to take your obsolete gear from you so that you need not worry about it. Check your closet; it may be full of obsolete gear. 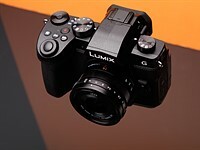 About 50mm lenses (the most essential to me) I was stunned to see that the new Panasonic 50mm f/1.4 costs 2200 dollars. The F mount 50mm F1.4 is F1.4, something the Z mount can't do. Agreed it's not the sharpest wide open. But stop it down to F1.8 and it's usable. Let us compare apples to apples, The F Mount AFS 50mm F1.8 vs the Z Mount F1.8. The F Mount F1.8 is also fully usable wide open and for $219 new is a steal vs the $599 Z mount. The Z mount is more than double weight of the F mount lens, starts to defeat the purpose of using a prime. A Z7 with Z 50mm is almost same weight as a D8XX series DSLR with 50mm. Nikon, as someone who loves adapting lenses (often legacy lenses), this adapter doesn't cut it as this adapter doesn't fully support your historical lens lineup that you're proud of as much as your own DSLRs or as much as it could. For the FTZ II, enlarge the tripod foot (why not, it's already unsightly so you may as well increase its utility) and jam a focus motor in there as well as circuitry for aperture coupling for pre-AI, AI, and AI-S lenses that senses the mechanical coupling for aperture tabs/prongs you should provide around the mount - you've got the technical expertise and plenty of room to fit it all in with your flange distance difference. I'd buy one, and at least... three other people would too. Nikon for decades and decades won out to Canon because their exotic lenses were adaptable from coupling prong to AI lenses to notches in the flange but this time the adapter is unacceptable it defeats the purpose of having light and small-ish FF Mirrorless. most store does price match after 30 days. But if you buy something long before and hope you get a price match from a year ago, you must be in some special world I don't know of. Even Costco stopped their generous policy because people abused it. If I bought. Nikon D70s on release for £1200 with kit lens would I expect a £700 refund when the price fell to £500? How many rebates are Sony giving to first time A7II buyers? @cosiniaphile, don't feel shortchanged! Think of it you're propping Nikon's balance sheet and paying for others to get bundled adapter with plunging Nikon Z prices. Since the release of the Nikon Z6/Z7 and Canon's R, Sony has lost 1/3 of its market share. This would be fine if the market was growing or remaining flat, but the market is contracting, which means Sony is in deep doodoo. That is why Sony is offering close to $1100 in trade-in and rebates on their A7/A9 cameras currently. @NexLupus - You don't seem to understand how market share and percentages work. When you have 100% of market share, and a new competitor enters the market, your percentage of market share will ALWAYS go down from 100%, even if your sales volume doesn't. Secondly, the fact that Sony's market share only dropped by 1/3 against the COMBINED forces of Canon and Nikon is actually quite low. That means that even after Canon and Nikon released their FF MILCs, 2/3rds of new FF MILC buyers still chose Sony over Canon and Nikon. That's actually quite a poor launch performance for Canon and Nikon FF MILCs. And thirdly, those statistics only pertained to Japan, where Canon and Nikon are particularly strong. But even in Japan, they were only able to take a mere 32.5% of market share. 22.1% of new FF MILC sales went to Canon, 10% of new FF MILC sales went to Nikon, while Sony still walked away with a whopping 67% of sales. They should have done that right from the start in order to attract those with existing lenses. anyone know what is inside that annoying bump at the bottom of the adapter? The camera can' even sit flat with it. That bump is where you place your palm to cradle the camera steady. The bump looks goofy. It looks like the chin of King Tut. @iDM, why? The camera body has no tripod mount? Possible. Considering Nikon forgot to make the adapter part of the Z. @idM most big glass I've seen, tries to get the tripod centered under the heavy glass (away from the body). This adapter just looks weird, the camera doesn't even sit flat with it on. The bump with tripod mount looks like a bad design that doesn't really add any functionality. That bump is for the aperture mechanism (not autofocus as others have said). Most Nikon lenses used mechanical aperture levers, where a small arm in the camera would push a lever on the lens to open or close aperture. Nikon only recently changed to electronic apertures. These lenses are marked "E" lenses. It's difficult to see a future for these Nikon and Canon FF ML cameras with a different mount. It's either expensive and big lenses that unbalance the duo camera/lens or adaptors that add further complication to the gear and some times restrict performance. Most of their capalities are perfectly covered by dslr cameras which are same price or cheaper. Complicated road ahead. It's infinitely more difficult to see a future for Nikon and Canon without the new mounts. The days of the flapping mirror camera are slowly going to recede into history. 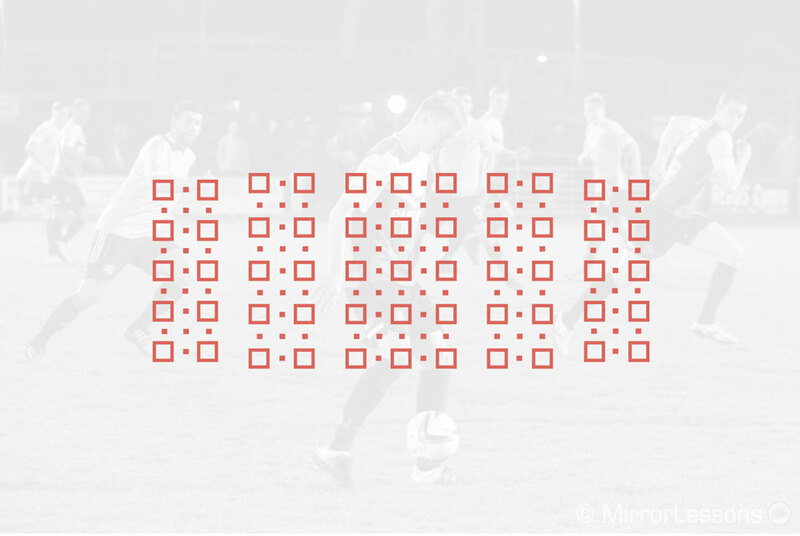 Once you use a FF mirrorless body that has focus point coverage across the entire viewfinder frame (rather than just isolated to the center of the frame), with face and eye recognition AF, real-time exposure preview, a histogram in the viewfinder. and the ability to shoot without mirror slap, it's hard going back to DSLRs with optical viewfinders that don't offer these things. I also don't miss lugging around the bulk and weight of a DSLR either. I came from a D800e to a Z6 and I must say, I enjoy the Z6 so much more. The AF is more accurate and the viewer much better. T3, I think D500 and D5 have quite good AF coverage. The problem is Nikon and Canon waited too long. They milked the mirror for every penny they could. Now comes the hard part, milking them again with people that are happy with what they have. Sony didn't have this problem. Their legacy was weak to begin with, this gave a strategic advantage and when you say FF mirrorless in 2019 you think Sony. That's hard to overcome. They will, but the real question is market share. In 5 years Sony could be 40% of FF mirrorless. It's not out of the question. @mferencz.... you're absolutely right. Nikon and Canon waited to the very last minute and left themselves no margin for error going forward. They will both need to be aggressive to prevent Sony from taking more. That's why it makes sense for them to bundle, discount, etc because right now they are fighting to hold onto market share while building out the new systems. @ozturert - "T3, I think D500 and D5 have quite good AF coverage." The D500 has better focus point coverage because it is an APS-C camera, so the focus module is able to cover more of the frame since an AP-C frame is so much smaller than FF. "real-time exposure preview, a histogram in the viewfinder"
Sigh... people keep repeating this point like they don't realize 1) DSLRs have live view 2)most people shoot aperture priority anyway. The only substantial thing that MILC bring that DSLRs cannot have is LV mode is way more convenient to use + more options for wide angle lenses besides retrofocus type designs (although small flange distance makes it more difficult to correct vignetting). I would also add size/weight advantage, but the latest releases from Panasonic contradict that statement. "1) DSLRs have live view"
Most people hate shooting DSLRs via live view. It's the most non-ergonomic, non-stable way to use a DSLR. People prefer to shoot their DSLRs at eye level through a viewfinder. And this is especially true of DSLR which are typically larger, heavier, and typically lack IBIS for stability. "2)most people shoot aperture priority anyway." 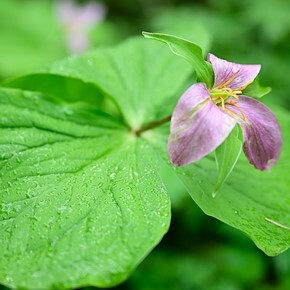 What does aperture priority have to do with anything? You can shoot aperture priority and still get incorrect exposure. Metering systems can't read your mind. If you shoot a white snow scene, cameras will expose the snow as grey because metering systems are designed to expose for 18% grey. But obviously, the world isn't 18% grey. That's why real-time exposure preview and/or a histogram is valuable-- they allow you to see how the camera is going to expose the scene before you take the shot. 2) yes, you can shoot AP and get incorrect exposure, but it doesn't seem to bother people much, especially if they know what exposure compensation is for. IMO people make that 'live exposure preview' thing a bigger deal than it actually is. 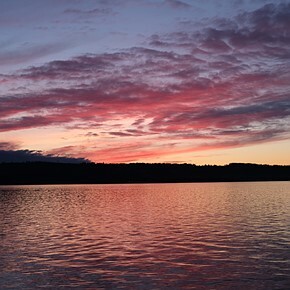 This is not analog color slide film, where the tolerance for exposure errors is miniscule. In modern digital photography, when you can push the shadows a lot (and even pull the highlights quite a bit) without much impact on IQ, people don't care as much, until they want the best from their in camera JPEG engine. @Heliar - "2) yes, you can shoot AP and get incorrect exposure, but it doesn't seem to bother people much, especially if they know what exposure compensation is for." Having real-time exposure preview and a live histogram in the viewfinder makes using exposure compensation easier and more precise. You can actually see the effect of whatever exposure compensation you are adding. It's no longer a guessing game. A few years from now when mirrorless cameras are the norm, people will look back to the DSLR era and think how ridiculous and antiquated it was to NOT be able to see the effect of exposure compensation adjustments in the viewfinder, and that we had to wait until after taking the shot to see how much exposure comp effected the image. As a mirrorless shooter who switched from DSLRs, I find that to be rather ridiculous and antiquated right NOW, lol. All the pros at pro sporting events are still using high end DSLR, no Mirrorless. Enough said. The D850 autofocus is superior for fast moving sports, tracking, vs Z7 that is fact. The D5 even better. Someday mirrorless will be there, just not now. The Nikon FTZ adapter is overpriced anyway because it has limited functionality. 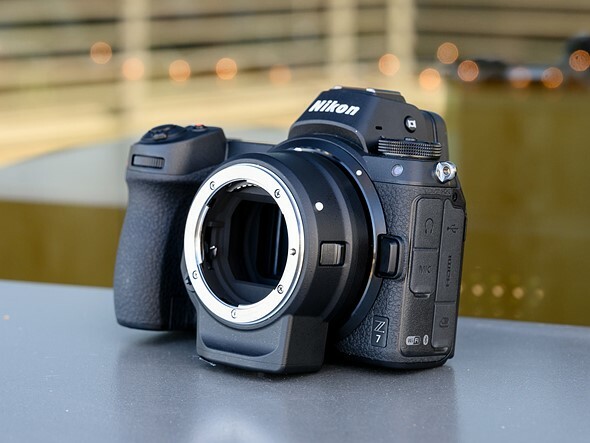 It must provide same functionality with "AI‑s" and "D" lenses as on Nikon D750. Funny seeing all the armchair marketing experts coming out talking about poor sales with zero data. My local store can't keep them in stock, but that is admittedly a small sample size. Those Amazon lists are well known to be completely useless, but if you have any actual data (from Nikon or somewhere similarly reliable) I'd be genuinely interested in seeing it. Without actual sales numbers over a proper sample area you are making wild, uneducated guesses. @DualSystemGuy - You can ignore Amazon all you want, but they sell more cameras than any store in the world. Denial is a sad thing. But feel free to cite the sales of your local camera store, lol. Amazon sells more cameras in a week than your local camera store will sell in a year. You did not read my post at all. Nobody said Amazon wasn't a big supplier, but those lists in particular have been long proven to be extremely inaccurate for determining sales numbers (of anything, not just cameras). Once again if you have any actual objective data that speaks to the sales numbers I'd genuinely love to see it. You also apparently didn't read my first post where I am the one who said the sample size was small and didn't mean anything, but you seem to have missed that part too. I also don't think you know what denial means...all I have done is ask for factual information to back up the claims being made, I have never once said anything is or is not true. Maybe Z sales are horrible or maybe they are amazing, but we wouldn't know either way because nobody can seem to come up with any actual sales number data. For all we know they discovered their lens sales go way up when they include the adapter - there is more than one reason to do things. @DualSystemGuy - And yet you are fine saying "My local store can't keep them in stock"? LOL. That's reliable? Do you know their stock volume? It's tiny compared to Amazon. 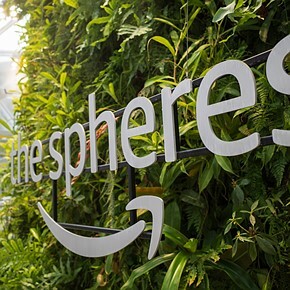 Amazon probably is selling hundreds, if not thousands, of cameras every week nationwide. 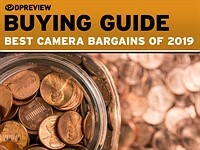 The sales rankings show the popularity of one camera relative to another. 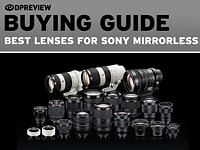 For example, the Sony A7III is #1 on Amazon's Best Sellers in Mirrorless list. The Z6 is at #26. From this huge disparity in sales rankings, you can get a decent idea of how much more popular the A7III is compared to the Z6, especially when you consider that there are also other Sony FF mirrorless bodies that are ranked between the A7III and the Z6. Considering how huge Nikon's user pool is compared to Sony's, we would certainly expect the Z6 to be doing far better than it is. But it's not. I literally said: "admittedly it is a small sample size", meaning it was a point of interest but it clearly is not a representation of Nikon's sales. I don't know how more simply I can explain that to you. Not once did I say, or even remotely imply, that my local store's sales were representative of Nikon's overall mirrorless success but you can't seem to see it any other way. I know exactly how those lists work, thanks - they are not an accurate indication of Nikon's overall Mirrorless success one way or another. I work in marketing for a living and it is clear that you do not :) Without sales numbers from Nikon you know nothing. Like I said before, there is more than one reason to do something - it's equally possible that Nikon learned that more customers buy a lens along with the camera body if the adapter is included, increasing overall sales. But since we have no actual facts, we just don't know either way. All I want is actual data, I don't care what the outcome is. 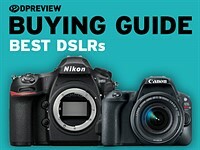 @DualSystemGuy - "they are not an accurate indication of Nikon's overall Mirrorless success one way or another." Of course they are. If the Z6 was the #1 best selling mirrorless camera on Amazon, I would have no problem saying that it was a sales success, given how huge Amazon's sales volumes are. But unfortunately, the Z6 is far from being #1 on Amazon in mirrorless sales, not even against other FF mirrorless bodies. And in fact, it was doing far worse until Nikon started selling it in bundles with freebies thrown in. Keep in mind, the A7III is selling well at list price without any add-ins. 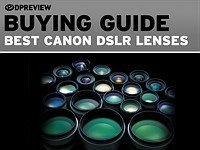 "The sales rankings show the popularity of one camera relative to another. For example, the Sony A7III is #1 on Amazon's Best Sellers in Mirrorless list. The Z6 is at #26. 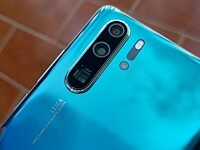 From this huge disparity in sales rankings, you can get a decent idea of how much more popular the A7III is compared to the Z6"
...this is a tally of sales since the camera's were launched, the A7III has been for sale nearly 3x as long as the Z6, p. Plus the A7III is part of an ready upgrade path for existing A7x users, while the Z6 despite the adaptor is a new mount and concept for Nikon users. More water needs to pass under the bridge before stats can be compared. @left eye - No, it is not cumulative sales since launch. If that were the case, then new cameras would never shoot up to the top of the list like the EOS R initially did when it was launched! It never made it to #1, but it was definitely in the top 10. Likewise, when the X-T3 was initially introduced, it was in the top 5 of mirrorless sales. Right now, the recently introduced A6400 is #2 (kit) and #5 (body) and #7 (kit). It was just announced in January! More water needs to pass under the bridge? No, your claim holds no water. So it's either just sales in a current short current period, or sales in a medium period weighted towards sales in the current short period. In anycase for sure there maybe more people upgrading their A7/A7II to the A7 mkIII than buying into a new Z system - just as we might expect. And as we might also expect once the Z6/Z7 wheel starts spinning with greater speed it will become a system photographers buy into the next model. I'm not 'defending' Z6/Z7 sales or wishing to squash A7III Amazon sales data, but merely trying to stand back and observe, and keep observing, standing on the bridge for a while. @john Clinch - Last week it wasn't in the top 50. Now the Z6 has jumped to #15 thanks to it now being bundled with a free FTZ adapter. The question is whether that ranking leap will have staying power. For example, the A7III has consistently been in the top 5 ever since it was introduced in February. Right now the A7 III is at #1, and it has been in the market a lot longer than the Z6. Relative to Sony FF MILC, it's still getting swamped. And like I said, last week it wasn't even in the top 50. Just looked into crystal ball and saw this: Z6 at $1600 before 2019 Xmas and Z6s with 2 card slots and improved AF at $2100 mid 2020. Well, the Z 6 will already get some AF improvements in May according to Nikon (Eye-Detection AF; improved low-light AF performance). Some people must really ,really, really like mirrorless! Even with a free adaptor, this Z7 costs more than a D850! I would not buy a Z7 if it was $1000 less than a D850! I find the adaptor solution really ugly (and I am a Nikon fan)! Bingo. That adapter is clunky, and ugly as sin. It cancels out the size/weight savings, too. At $3100, the D850 is the better buy, IMO. Heck, even at full price, it's better. I almost preordered a Z7 last year, but once I saw the specs, I came to my senses. My interest in it, or any of the current ML cameras, is near zero. IBIS, much greater focus point coverage, face/eye AF, real-time exposure preview, a histogram in the viewfinder, faster frame rate, bigger viewfinder, etc. That's what the Z7 offers. 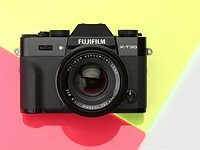 Plus, one can just as easily say that the obese-looking D850 is quite ugly. If the D850 were a car, it would be a minivan, while the Z7 would be a sports car. One is huge and clunky, the other is light and agile. d850 would look like a truck or a large SUV. Most rural America like big gas wasting cars. City people like smaller stuff (density). Trucks are actually the top selling automobile in the USA. A minivan would be a d610, a little underpower in the spec but made for the family. If you have VR then you don't really need IBIS. Telephoto you need VR, it is just physic (even if the Z mount is one of the bigger to adjust, on on a 800mm the movement is too much and the VR works better). The Z can at least do both so that is a better benefit. @NOWHITELENS - "Never in my life have I missed a shot because I did not have a histogram in the viewfinder ;-)"
No one is ever going to miss a shot due to not having a histogram in the viewfinder. But you're more likely to get a perfect or near perfect exposure when you have real-time exposure feedback and a real-time histogram in the viewfinder that is delivering you this visual information while you are still composing the image, as opposed to after the shot is taken. I can tell you that I do far less exposure tweaking in post-processing, as well as far less chimping, ever since I started using mirrorless cameras with this kind of valuable real-time information in the viewfinder. Technology really does bring benefits. It's not enough to simply dismiss technological advancements by saying, "I've managed to take pictures all this time without all these advantages." After all, people said the same dismissive things about auto exposure, autofocus, rear LCD image review, etc. I know not all cameras are ISO-less, but nowadays, they are pretty close. It's nice to get exposure right in camera, but I know that there's a ton of wiggle room in post since I've got the RAW file. Just gotta be careful not to blow highlights. personally for me histogram just looks cool. I would turn off that crap if it is in my viewfinder which it isn't. I need room to frame. ( I spend time focus zooming on my Z viewfinder) Most camera metering in the modern age does fine. If it looks good in the viewfinder it should be good. Seeing wave really does not do much to me. The waveform diagram on dprievew is more interesting as it showed what is the hot spot great for video. I don't use live histogram like most people, I know. Most people don't give a f-s about live histogram. If you do good for you just don't tell people HOW to shoot their camera. @xPhoenix - You're missing the point. It takes time and effort to make these adjustments. It's not as if we couldn't make these adjustments before. I do find that getting it right in camera means less time in front of the computer later. And yes, you get fewer blown highlights when you have a histogram in the viewfinder. All of this information can be extremely valuable, especially when you have access to it before you take the shot, as opposed to after taking the shot by chimping your image. And even if you never used a live histogram in the viewfinder, you still have real-time exposure preview, which is already a lot more informative than an optical viewfinder. @T3. Sure, some of those things would be useful to me, no doubt. I just don't need them enough to want to spend a bunch of money on a new body, and buy new glass (I'd prefer native over using an adapter). I am sure a lot of these features are handy for some people. I think it depends on what and how you shoot! 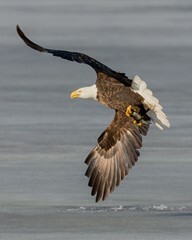 I take a lot of pictures of birds in flight with 600-850mm lenses. I like to have as little as possible in my viewfinder other than trying to keep the bird in there. Histogram or real time exposure would be totally useless in this case. Both Z6 & Z7 prices are higher than the value of the cameras. I was ready to buy Z7 first moment it was available. Yes, Z6 & Z7 are a bit expensive because they have factored in the FTZ Adapter "free give away" into their pricing only few knows it. If Nikon builds it they will come. If they give the adapter for free they will buy. So much shoddy thinking in this thread. They should have given the adaptor away at the beginning. It made no business sense to give the adaptor away at the beginning as it's only of use to people with F mount lenses and many purchasers will be new to Nikon and not have these lenses. Nikon bundling the adaptor is a sign sales are bad. No. The fact that Nikon is bundling it now cannot be an admission the camera is not selling well as it offers no value to general purchasers, who would prefer a price cut, it only suggests the take up has been slower amongst Nikon DSLR owners as they are the only people who could use the adaptor. It's a response to pressure from the Canon RP which includes the adaptor for free. The Canon RP needs the adaptor to use the kit lens Canon is bundling with the camera, which is EF mount. They have to include it. I'm not a Nikon guy, so I don't really care. But, I question your first argument. The camera looks nice, so I could certainly give this is a look if I was in the market for a new system. But, I would be irritated if I had to pay an extra $150 or $250 in order to have the OPTION to use all the legacy lenses, of which there are a few. If I'm dropping a few grand to get into a new body, I at least want to be able to pick and choose where I'm going to spend what remains of my bank account on lenses. Yeah, I get that ~$200 is something like 5% of the cost of the body and a nice new Z-mount lens. It shouldn't matter. But no one likes to be nickel-and-dimed. When you want people to jump ship, it helps to throw them a line. Lol. That's terribly optimistic and obviously wrong given this new bundling targeted squarely at existing Nikon users. Both Nikon and Canon are very conservative with their initial FF mirrorless options. I can't imagine anyone BUT a canon-nite or nikon-nite sidegrading to one of these models. It may be a surprise to you but most products are aimed primarily at new users. It's the only way you stay in business. I wouldn't buy a Z camera, but I expect (and want) Nikon to keep trying to sell to me and I don't expect them to be ashamed of their offerings, regardless of what I think of them. They can aim the products at whomever they wish, but it doesn't mean it'll catch on. I'm a Nikon user, and I have zero desire for a Z camera because it has nothing to offer. As for new users, I doubt many were waiting for Nikon to release their Z. People who wanted ML when it was new bought Sony cameras. Look how long the D850 was out of stock after release (a long, long time), and then look how long the Z was out of stock (hint: it wasn't long). Pretty soon they will be giving these away. It made no business sense to give the adaptor away at the beginning as it's only of use to people with F mount lenses and many purchasers will be new to Nikon and not have these lenses." Couldn't be more wrong. Since the vast majority of Nikon lens users were using the F mount lenses, and since the largest potential market was current owners of Nikon cameras, it makes the MOST sense to keep them in the ecosystem. The best way of doing that is to provide a means for them to use their current lenses. That is done by throwing in the adapter. ... many purchasers will be new to Nikon and not have these lenses. ... Nikon DSLR owners as they are the only people who could use the adaptor. How many used Nikon FF lenses currently for sale on eBay et al? How many Z lenses available now? How many cheaply? You guys don't get it all. Nikon did not just make this camera for Nikon DSLR users. 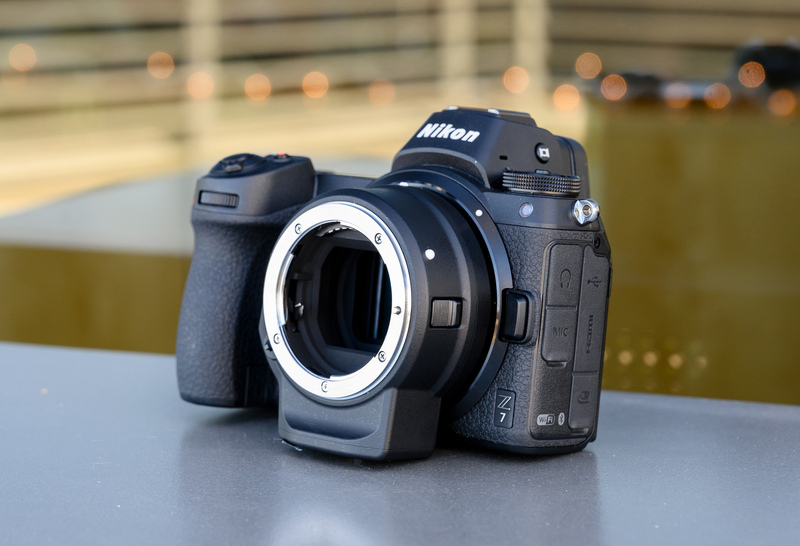 Half of Nikon's DSLR users don't even think there's any point to mirrorless. Nikon would go out of business if it was relying on those guys. I'm not a Nikon shooter (except for adapted legacy glass on non-native bodies) but the Z6 looked, felt, and shot great even in my limited trials. 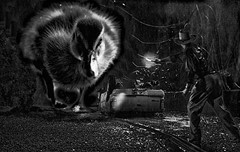 I'd much rather throw down for this than a mirror slapper, even one of higher resolution. Cuz video through the viewfinder, at minimum.. It's pretty easy to see where the future's gonna be. Obviously you don't shoot pro sports. The mirror flapper is superior. D850 and D5 superior tracking autofocus for sports. The Z bodies with a F2.8 zoom lens are totally unbalanced in the hands, nose heavy. For someone doing a paid event such as a wedding over 4+ hours that is a liability/uncomfortable.. I thought that's why you hold the long lens with your left hand and the camera body with your right, so it balances in your hand? I don't shoot pro sports, that's true. But it's not difficult to see where camera tech is going.. old fashioned optical SLRs have gotten about as good as they're gonna get (and that's pretty good..) but mirrorless is only getting better and better.
" old fashioned optical SLRs have gotten about as good as they're gonna get"
Aren't advances in mirrorless aplicable to "live view" on DSLR so it's the best of all worlds and they will get better and better along with mirrorless? Well they can always slap in a higher resolution sensor, but the disadvantages of the extra mechanical systems and enforced blackout times remain. Again, not throwing shade at the tech on which I grew up-just looking forward to ever better mirrorless offerings. Letter of alphabet begins with an A and ends with a Z. There was an S, OK. An F, awesome immortal cameras. Then a D, yeah, digital ... a Z. is this the end of N ? When you're criticising the name or designation of a product you've got no arguments. RubberDials, I think you've missed the joke here. There isn't a joke, only an insult. Not interested in that and I'm not even a Nikon user. I really don't know why they decided now to include it with the purchase of the new Z camera. I suspect sales are luke warm. People have decades of good Nikon glass that won't fit on the new cameras and just not interested possibly. I guess they thought mirrorless would sell itself and people would be jumping at it and are realizing not so much. Nikon needs a 1300 us dollar FF camera fast. Sony with old models and Canon have it. I don't think Nikon users are switching teams too much , they just aren't buying 2k cameras when they have one that works just fine. I didn't realize that the Nikon adapter had the odd "bump" on the bottom. I would imagine that this would take a little while to get used to. What is in there? Well, some of the tech "experts" here will go obsessive over how the bump should contain extra card slots. Looks like a monster for a mirrorless camera. I know size and weight isn't the only advantage of ML, but it is one of them. Thing is, this camera isn't all that small to begin with. All my glass is F-mount, so if I want to use it, I gotta tack on the adapter which adds even more size and weight. Nah, I'll just keep using my DSLR. Still prefer OVF as well. Just during the weekend I held Z7 with 35mm f1.8 next to my D850 with 24mm f1.4, while Z7 set is noticeably lighter from the point of size it doesn't really make much difference. I'm fine with the adapter for F mount lenses (can't be done otherwise anyway) but the current and planned Z lenses are nothing I was looking for. Computational photography? How about using software correction to replace a physical adapter? This may well be orders of magnitude more than today's software correction of optical distortions but I don't know why it won't be possible at some point. 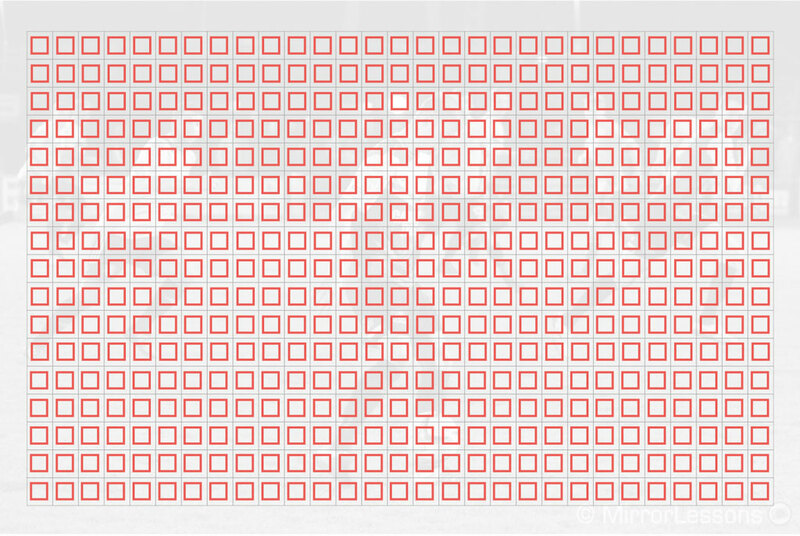 Software likely couldn't fix an image meant to focus 20mm behind where the new sensor is. The flange back distance of Z mount is half of what the old F mount was. Plus which, if I wanted half a dozen shifty pictures melded into one slightly less shifty picture, I'd stick with a Pixel 3. I'm shooting a real camera for a reason-and that reason is quality image from proper optics and a big sensor. Went to the The Photography Show and the Nikon stand people were very friendly but one got agitated when I mentioned the one card slot. Got a bit riled to be honest.Think someone must of mentioned it to him ooh 100 times! They had the new firmware in the z6/7 and they compared it to my Sony. Hmm the Nikon box wasn't sticking to the eye quite like glue. Nice camera though. Would buy one if I was loaded. Wholeheartedly agree. Also, I think they ARE desperate to sell these cameras. Of course they're desperate to sell the cameras, so is Sony, Nikon, Canon et al. That's their business. The adaptor is only of use to the last group. You don't give away something a large proportion of your buyers won't and can't use. That's just poor business. Every company is desperate to sell the things it makes. RubberDials if bundling it at launch makes no business sense then why would it make sense now? Bundling at launch helps maintain brand loyalty and that's good business! The amount people care depends on how recently they paid for the adapter. Car buyers even worse. buy a car to find out a month later there’s a 3k rebate...OH WELL. "RubberDials if bundling it at launch makes no business sense then why would it make sense now?" Presumably Nikon has now conducted research into sales and discovered that a majority or at least a significant number of buyers were existing Nikon users, rather than new purchasers, so bundling it could stimulate sales. Might be one of the fastest price drops seen for a new Nikon camera model? Apparently the Z cams are not selling terribly well. Happily waiting for the next generation with decent fps + AF. 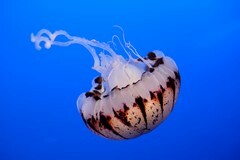 We are getting close to 1st April which is end of fiscal year in Japan. Nikon wants to sell as many as possible until then. I think they will not continue this from April until mid-summer. The market for such cameras with a 35mm sensor is very limited. The prices are very high, to high for the consumer to leave their smartphone. In addition a FF camera plus lenses are heavy and bulky so people do not carry them in their daily life. The digam market is going south and the mirrorless does not stop. Yep. These companies are betting big with ML cameras that are all very expensive. Personally, I think it's a bad bet. The market has been dying for a while, and yet some bonehead is like, hey guys, let's charge even MORE money for cameras that aren't as good as DSLRs. Sadly that is true about plummeting sales. And most photographers out in the real world barely care about the FF nonsense. 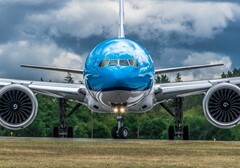 That may excite tech types but not practical results oriented photographers. See Ming Thein's article on sensor size. said the guy with a crop sensor. The difference in IQ is real. Steve FF has greater IQ. But in reality although I do alot with my photos in reality I've never needed more than 12mp. FF gives the ability to crop more than smaller formats and is more forgiving in PP. It is my understanding that 18mp is the upper limit of what (except for rare cases) is needed in commercial photography. Sensors with 36mp or more just tend to show how much of the image is OOF. I think this explains the current bokeh craze. I’m with you that most people don’t care. I just spent two months photographing owls and would go home to analyze every image, where the majority of the passers-by were equally as happy taking out their cellphone, taking five pictures and continuing on with their day. Defiantly a Canon RP reaction. Hopefully some more cash-back and street level type discounts will pull the cost of acquisition down to the point I can afford it. Right now as a Nikon user with a few old lenses. the RP is attractive, given cost of good adapted lenses. honestly the Z6 has so much more expensive parts inside than the RP, its not even fair to compare. The RP is probably worth 100$ in parts where as the Z6 is like 400$ at the very least! Why anybody want to buy a mirrorless without a IBIS is beyond reason. @wasTF 100 dollars? your mum more like! badbob, yeah that's what she said. The RP approaches the soda sold at McDonalds for ~99% profit. Parts are probably in 20 dollars range. Nikon subsidizes US customers and overcharge all the others. One more reason for me not to switch from my old Nikon DSLR. Yes but we get bit by pharmaceuticals though so far I'm not one needing them. Nikon isn't in a position to "overcharge" anyone for a camera. They only sell a camera when a purchaser is happy with the cost. They aren't a government entity that can impose a cost then enforce the payment of the cost. Wut why? They should be charging $350. I'd be surprised if Nikon couldn't make the adapter for $10. I think this might be a response to the Canon RP bundling its adapter to EF lenses with its body price at no extra cost. If this is not a reaction to Canon, then it is merely a smart marketing move to help with sales to owners who already own FX lenses and FX body already as this is an incentive to add a mirrorless as another body. I agree this makes sense. I am already saving up to buy an Z6 at some point later this year maybe. It has great reviews and some of the other photographers in my workshop groups are already using Z6 and like it. I will keep my D750 though for other uses. Canon has no choice but to bundle the adaptor, they're selling the camera with an EF lens. I said this before the cameras came out: This is what they should have done from the start. Finally they did it right. I really wish they'd do this in Japan. stingy here, but the market drives the price up and down faster than in the USA. It's a free adapter folks! Take a victory lap and be happy. OK? Yeah Tell that to the folks who dropped $250 for one a few months ago. Yeah, who would have thought that better deals can be available on a technological item when you wait a few months? Or those in other countries. Whatever. Discount campaigns are not that unusual. It's like people buying the lambo and complain about insurance or gas cost. If $250 makes such big dent in your budget you probably can't afford the camera in the first place. The camera must not be meeting Nikon's sales expectations. Nope! Nikon thought conned-sumers would buy its FF Mirrorless regardless adapter costs $250 and make money out of it. Nikon is wrong !!! Conned sumers no more !!! Nikon got the message. They are giving away the adapter for free yet still make money. I'd buy FTZ if they bundle it with Z !!! It is so ugly with the adapter. Oh, yes it is! Definitely! Absolutely! And the lens roadmap is far and between and cost an arm and a leg. Doesn't mean it's a bad camera, but by dog did their designers mess this one up! The deals is available in Canada at some retailers (Henry’s). The adapter is good only with relatively new lenses . The rest works only in a passive manner without any EXIF and requires operating a diagram manually.